With personal credit, you always know why you were turned down. It’s mandatory for lenders to provide you with credit report disclosures and let you know where you can obtain the credit report. It’s not as transparent with business credit. Lenders don’t have to directly inform you of the reasons. Instead, they can tell you where you can obtain the information. While personal and business credit are separate, they do overlap. Lenders often use personal credit scores as criteria when deciding whether or not to extend business credit. One unpleasant fact about personal credit scores is that any inquiry into a credit report can have a negative impact on the score. In other words, applying for business financing can actually lower your personal credit score, though this is seldom by more than a few points. It’s common knowledge that consumers can easily obtain free credit scores or credit reports. You’ve probably seen hundreds of ads telling you where you can get these. In fact, when an individual applies for credit and is turned down, he or she must be informed of which credit reporting agency provided the report. The applicant can then order a free copy of the report. Unfortunately, the same isn’t true for business credit reports. Many small business owners don’t even know that business credit reports exist. There are separate business credit scores but you have to dig a little deeper to get them. Keeping the above factors in mind, it’s good to be prepared before you apply for business financing. Review your personal and business credit scores before applying for loans so you know where you stand. While lenders don’t provide free business credit reports, you can get these. The major credit reporting agencies will provide them for a fee. There are also resources online that tell you how to get free business credit reports. Study the lender’s qualifications before applying for a loan. This saves you from wasting your time and possibly adversely affecting your credit score. If you do apply for a business loan and are turned down, do whatever is necessary to find out why. 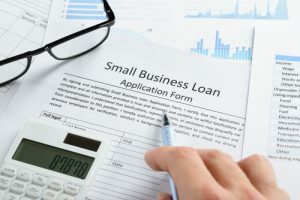 Small business loans are one way to obtain necessary capital and improve your business’s cash flow. Another way is to use invoice factoring, which provides you with immediate cash based on accounts receivable. To find out if your business might benefit from factoring, call Riviera Finance for a free quote at 800-872-7484.